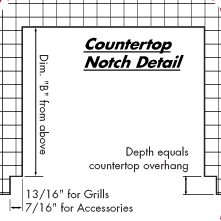 Built In: W = 27", L = 24 3/4", H above counter (Hood Down) = 13 1/4", H above counter (Hood Up) = 25 1/2"
Angular Pedestal: W (Shelves Down) = 34", W (Shelves Up) = 51", L (Hood Down) = 24 3/4", L (Hood Up) = 25 3/4", H (Hood Down) = 47 1/2", H (Hood Up) = 59 3/4"
Square Cart: W (Shelves Down) = 33", W (Shelves Up) = 51 1/2", L (Hood Down) = 25", L (Hood Up) = 26", H (Hood Down) = 48", H (Hood Up) = 60"
Bolt-Down and In-Ground Post are the same dimensions as Angular Pedestal. Is your island made from combustible material (such as wood or plastic)? You will need the Insulated Jacket, Item #SOL-IRIJ-27XL (see item for cut-out dimensions). 26" width, 21" depth, 8 7/8" height. Click the button below to add the 27XL Solaire Infrared Grill to your wish list.